DAPHNE, Ala. – Don Porter has spent most of his adult life diligently promoting softball around the world, and now the World Baseball Softball Confederation (WBSC) has honored his dedication to the sport by awarding him its Collar of Honour. Porter, who has served on the United States Sports Academy’s National Faculty and is currently a member of its Board of Visitors, was awarded the honor by WBSC President Riccardo Fraccari during the organization’s recent meeting in Botswana. 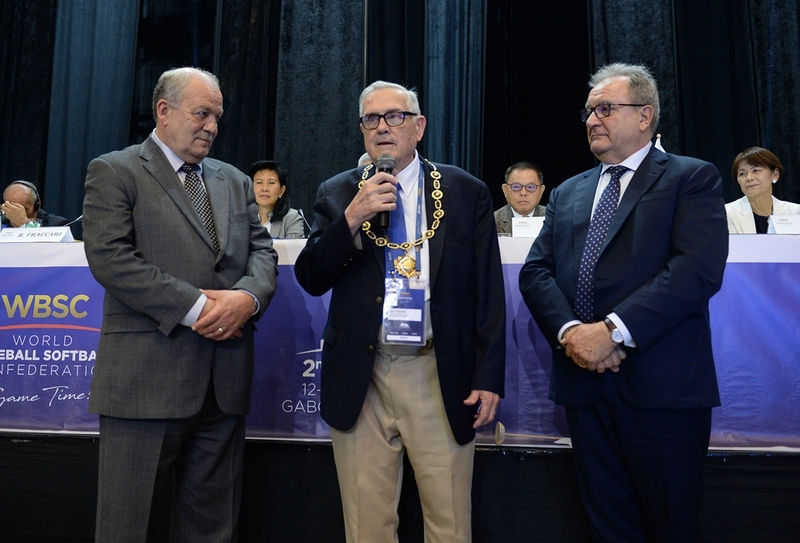 Porter was the president of the International Softball Federation (ISF) when it merged with the International Baseball Federation (IBAF) to become the WBSC. The Collar of Honour is the supreme recognition given by the WBSC. It honors those people who contributed to the foundation of the organization and its success. Under Porter’s leadership, softball was first elected to be part of the Olympic program for the Atlanta 1996 Olympics. After the sport’s removal from the Games following the Beijing 2008 Olympics, Porter helped found the WBSC, which set as a goal the inclusion of baseball and softball in the Olympic program. Porter, a resident of Oklahoma City, is also an author who recently had a book published about his endeavors in the world of softball. The book, “Inclusion/Exclusion: Softball’s Olympic Journey,” chronicles the highs and lows of the sport’s journey to the Olympics, then its return to the Games in 2020. Released by Yorkshire Publishing, the book is available for purchase on Amazon.com and BarnesandNoble.com. Porter started his career as executive director of the Amateur Softball Association in 1963, then became the secretary general to the ISF in 1965. He was elected ISF president in 1987 and led the federation until 2013. Porter served four seasons as an official with the National Football League from 1976 to 1979. Porter also served the United States Olympic Committee (USOC) as chairman and member of a number of committees including the Board of Directors from 1984 until 1998 and spent time on the USOC’s International Relations Committee. He is also credited as being one of the founders of the World Games.